Dodge Air Suspension, Good Idea or Just Fluff? All auto manufactures are competing in a lucrative and highly competitive truck market and so are adding features they feel will attract the most consumers. For Dodge, this translates in adding the air suspension, formally found on certain Jeep models, and adding it to the Ram lineup. However, the questions are; Is it useful and does it work? 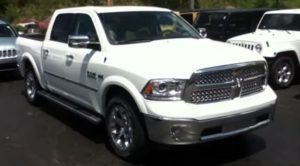 To make it simple, the Ram air suspension is a closed system that combines a compressor and air tanks with various sensors to provide on the fly or via user command, height adjustments of up to 4 inches of travel. The user can change between 4 modes, normal, off road 1, off road 2 and entry/exit. The dodge air suspension will also automatically adjust for situations such as hauling, towing and speed for a supposed better fuel economy and a better ride. Ignoring for a moment, that some of the answer depends based on personal preference. The air suspension load balancing capability would appear to be highly useful, especially trucks that see a lot of hauling and towing. Certainly, being able to automatically adjust for loads would provide an extra measure of stability and fuel economy. However, outside of a hauling or towing situation the usefulness would seem to decrease. In non load situations, the system will remain at normal driving level unless the system detects speeds above 62mph. Supposedly, this is to improve fuel economy but given that fuel economy is determined by a wide variety of factors, the overall improvement can not be significant. Certainly, not enough to warrant the extra price added. The system has gotten mixed reviews. Several owners have reported various issues and have had to have the vehicles serviced. To make the situation even more frustrating is not all mechanics have been brought up to speed on the new system, including dealer mechanics. Others have reported that parts are often out of stock as the supplies have yet to be fully available in quantity. However, it should be said that with any new technology in a vehicle is bound to have some teething problems. At this point, it is too early to tell if it will indeed give Dodge an edge in the truck market. Dodge fans will still be fans and new truck buyers will have to decide for themselves if air suspension is worth it.